Use YBS SuperQuilt in your next project without worrying about building control standards. SuperQuilt is LABC, BBA & BDA certified so is compliant for use in many applications. YBS SuperQuilt Insulation is the world’s highest performing certified reflective multifoil product on the market. 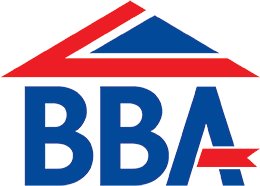 The product is designed to insulate roofs, walls, floors, loft conversions and conservatories using less space, cost and time compared to traditional materials like Kingspan or Celotex. YBS Insulation’s SuperQuilt is used in loft conversions to save on cost, head height and labour time. The multi-layered blanket can often achieve regulations in refurbishments without any other products. SuperQuilt is a 40mm thick material, manufactured in the UK using a combination of 19 layers. These layers consist of true aluminium foil, wadding and high density foam. SuperQuilt can be installed to the internal or external of buildings alongside additional materials to meet building regulations in less space than any other insulation material. It effectively stops excess heat from entering your roof in the summer and retains internal heat during the winter, keeping your roof at an ambient temperature all year round! See our full range of reflective multifoil materials at SuperQuilt-Insulation.co.uk to see how you can save on cost, space and time. SuperQuilt is available for purchase both in individual rolls or as trade pallet deals. Individual rolls are sold in the following sizes; 1.2m x 10m (12m2), 1.5m x 10m (15m2) and also 1.5m x 2.4m (3.6m2). Bulk trade pallet offers are only available in 15m2 and 12m2 rolls. Deciding which multifoil to insulate with can be tricky. To assist you in deciding which product is right for you we present a comparison between the most popular multifoil materials on the market. To assist you further deciding which multifoil insulation solution is best for you, please see our online instant U-value calculator. It calculates solutions to insulation requirements using products such as YBS SuperQuilt. There are solutions available for roofs, walls, floors and also sheds/summerhouses. It also provides solutions incorporating products as as; YBS BreatherQuilt, EcoQuilt Expert, Eco Non-Itch Wool and YBS Breather-Foil FR. Use our simple calculator to see how easy it is to meet building control standards with YBS SuperQuilt. 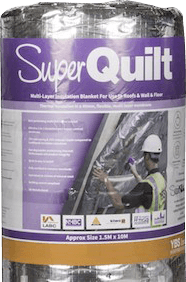 Contact the team at SuperQuilt-Insulation.co.uk, we will be more than happy to help.